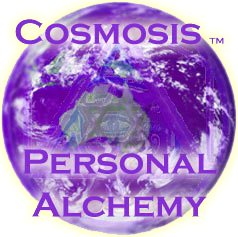 Cosmosis™ is an internal alchemical process for personal growth that enables you to change how you respond to the world. It is all about mastery of Self. This personal growth process changes your personal reactions and feelings about the people and situations in your life, and, instead of simply reacting to life, empowers you to consciously choose how you respond. It removes your old programming and faulty belief systems. The process has nothing to do with anyone or anything else, it’s just self meeting self time and time again until you get the message that everything in your environment is a reflection of you, and that your life is your creation. As you change your personal response to the people and situations you have attracted to yourself, your journey through life improves. It is very easy to measure your change because the people and situations pressing your buttons will suddenly appear to be acting differently, and your buttons won’t get pressed in the same way any more. As you use the process more, you will become more aware of your feelings and they will become increasingly heightened. This is progress, it is a sign that you are ready to transmute all feelings – both painful and enjoyable - that you have been avoiding and denying. Feelings are your soul’s experience of the totality of your existence as a human being, it is the soul that feels. Everything you perceive - all of your sensations (physical/etheric and spiritual bodies), emotions and thoughts enable your soul to feel. It is important to let go of anticipated outcomes. Your infinite healing intelligence decides what shifts first. Change doesn’t always happen in the order or the way your mind wants it to occur. However, you will be delighted with the speed of your accelerated growth. In the beginning you might only release one layer at a time around a particular issue. Very quickly you will gain the competence to release multiple layers at once and work at the deepest levels. Each person’s experience of the Cosmosis™ process will be personal and individual. Shifts typically will become more pronounced as you progress. Alchemy and Transmutation: Alchemy is the process of transmutation. Transmutation is about transforming a substance/energy into a higher, purer and finer vibration. For instance: fear into love. 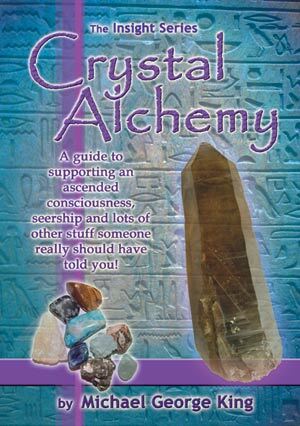 You can read Michael's article on the History of Alchemy here. Or watch the video at the top of this page. Love and Fear are not opposites; they are the same energy vibrating at different frequencies. Just like hot and cold on the thermometer are not really opposites, they are simply the same energy vibrating at different levels. Fear is not energised from source or spirit, we keep it energized through our habits and choices. 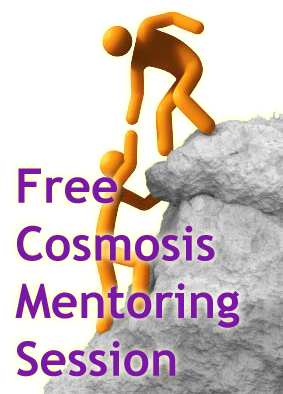 The Cosmosis mentoring process assists you to transmute any low vibration energy into higher vibration energy. This alchemical process is the central tenet of Cosmosis. Any issue you have is there because you have a judgment. The Cosmosis Mentoring steps are about aligning your bodies so that the trapped energy can be released back to its home in the space/time continuum which is at the moment the judgment occurred. When you judge something you lift energy out of its home, and it creates disharmony in that place as well as within you. This is why you feel out of place and things don’t feel right because you are dragging misplaced energy along with you. It’s like wearing giant magnets which are trying to pull the energy back to where it belongs. You restore harmony by allowing misplaced energy to return to its correct place. This process is a conscious choice and we can choose how our various bodies, tangible and subtle resonate in all moments . The truth is the truth and your eternal wellbeing lives in that understanding. We live in a world of science, technology and reason wherein magic and spirit are denied. Some of us still know that not everything can be measured and rationalised and if you are one of those people then welcome home. We are simply here to give you the opportunity to realise and actualise that you are so much more than you have been led to believe! Cosmosis™ is not a miracle or a cure-all but rather a process of transmutation that alchemically allows you to raise the vibration of your emotional baggage, limiting thinking, dysfunctional patterns, wounded or imbalanced states of being into love, self esteem, confidence, self assurance, compassion and wisdom . This allows you to progress towards embodying your highest potential as a human being and as a spirit, fully in self mastery of your energy, thoughts, emotions so that you no longer react to life like an automaton, but consciously respond to life with integrity. This enables you to be who you truly are - your authentic self and to consciously create your life, to anchor and express your mission and puzzle piece on Earth, here and now with a singing heart. This process takes time, hard work and courage. 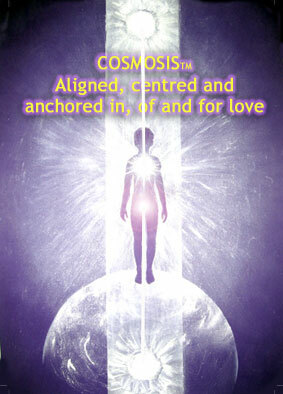 Cosmosis™ allows you to own and acknowledge your issues, learn from them, let them go in peace and gratitude, transmuting them in the process. As a result you create more harmony both within yourself and your environment. Cosmosis™ is easy to use and does not require any bodily movements, tools or any other props. All you need is yourself, the will to move beyond your present conditioned limits, and the desire to embrace more Love. The Cosmosis process has been thoroughly designed and developed to ensure that anyone willing to let go of old baggage and applying the steps correctly is able to expand into more of their true potential. A major focus of our training is gaining wisdom and clarity. What does that mean? It means clearing out old fear-based patterning and programming. All the things we have taken on board which has limited us in some way, which has kept us from seeing the Truth and the Knowing of our own hearts. In working on gaining wisdom and clarity we regain our individual sovereignty – we are not controlled by anyone or anything external to ourselves. We are then free to hear the voice of our own heart, to hear our own Truth within, to hear the voice of Spirit and connect with Source ourselves. Many people settle for mediocrity in life. This process is not for those people. This process is for those of you who wish to be truly outstanding individuals in a sea of mediocrity, to seize the day and actualize the greatness that you inherently hold within as a human spirit. As you work through the processes and lessons of this course you will be uncovering the true You - your authentic self. This is the gift that you are then able to take out into the world and share with others. It is envisaged that you will be able to teach others wisdom and clarity, sharing your spiritual gifts and playing a part in creating a world of unity, harmony and unconditional love. Imagine a world where all people live in harmony. Everyone on a voyage of self discovery – each supporting the other, lovingly. The Truth is prized and ‘success’ has a new meaning. Imagine a world in which the predominant thinking is in the spirit of “Let us co-create...” instead of “I want.....”. Imagine being inspired and inspiring. Through our training programs, let us co-create this new world of equality, unity and harmony with courage and joy. We understand it can be challenging to discern the truth from illusion and to make the leap from the familiar to the unknown, to trust we are safe to explore new ways, to expand our focus and awareness, see the world and all her colours with fresh eyes and truly be a part of the transformation that is occurring right here, right now. Are you ready? The time of Transformation is here now if you but choose! We have designed a unique course structure that facilitates the ancient mechanism of self-transcendence and integrated personal growth. While there is the one central focus of unconditional love and wisdom in practice, it incorporates 9 key areas that ground a new paradigm blueprint. See diagram below. This is a new concept in learning and facilitation which allows you to step out of the linear timeframe. The 9 key areas are intertwined that provide you with a map that enables you to discover your own innate wisdom and effect your own investigation into your origins without the need for intermediaries. Energy healing usually involves some conscious use of knowledge of the human energy field, as well as specific techniques to address disturbances. Programs which are based on the medical model will have an assessment of the energy field, and techniques will be chosen that address the disturbances found. After the energy healing is done, the healer would re-assess the field to discover the outcome of the treatment. Traditionally, spiritual healing is healing in which the healer is felt to be an instrument of the divine, allowing the power of the divine to heal through him or her. The healer acknowledges that he or she does not do the healing. In a sense, the healer is only the instrument through which the person seeking healing surrenders to the divine. COSMOSIS™ Transformational Healing has aspects of both energy and spiritual healing as well as involving training, mentoring, counselling, introspection and self awareness techniques. The fundamental basis for Cosmosis™ transformational healing is to embrace a working hypothesis which states that we are all from the same source and so fundamentally are all aspects of that one source. Our understanding holds that it is self evident that the Body, Mind and Spirit are interconnected and inseparable. And since our aura (The Human Energy Field) interacts with others, as well as with this spiritual Whole, so do all of our actions, beliefs and thoughts effect that Whole. From this understanding we choose to accept that we are all part of a greater interconnected benevolent being-ness and learn to exercise healthy boundaries based upon a personal preference for ever greater love, wisdom, tolerance and contentment through service to that spiritual Whole. The resulting understanding becomes the lens through which healing and enlightenment occurs. Within this process there is an absence of the rather ugly dogmatic bias which characterises some other schools of philosophy and religiosity. 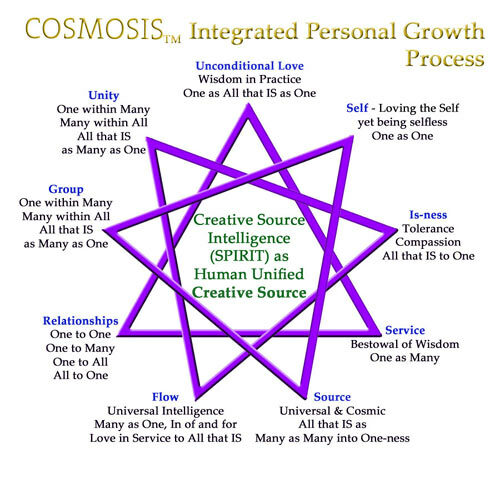 The Cosmosis™ personal development/enlightenment/ascension process is a systematic identification with this greater being-ness which translates to greater understanding, wisdom and love. This then flows on into behaviour change as we learn together to engage in a true culture of love, tolerance and wisdom. The more one acts out of this understanding the more one is freed from the ‘thou-shalts’ we have been carrying around with us. Ultimately through dedication and hard work with this process of self awareness and expansion of consciousness we personally effect our own investigation of the ‘truth’ and learn to become expressions of our own source on the planet and to the planet. The major potential pitfall in any spiritual process is what is now being popularly termed the ‘more spiritual than thou syndrome’. We by no means testify that this is the only way to enlightenment, it is but one way which you may choose if it resonates as relevant for you.